With St. Patrick's Day right around the corner, we wanted to share with you the top 5 infographics of the week on the green holiday. Total spending in the United States on St. Patrick's Day is expected to grow to $4.7 billion this year, 41% of people will celebrate at a party or bar, and 1% of the annual world consumption of beer will be consumed on St. Patrick's Day. Check out the infographics to see the rest of the stats - like how people plan to celebrate, what types of beer and whiskey are most consumed, some history on the holiday and more! 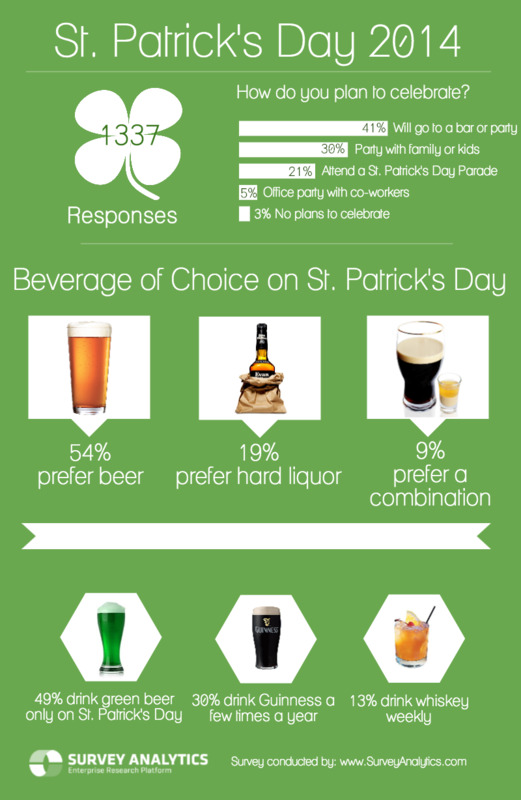 Continue reading to see four infographics about St. Patrick's Day we handpicked and one that we created ourselves with the data from a recent survey we conducted to Americans on St. Patrick's Day 2014.